Started every game at right guard in 2015; one of just two offensive linemen to start every game (Rod Johnson)…recorded a season-best grade of 81 percent against Syracuse…was on the offensive line for the USF game that featured Dalvin Cook rushing for a career-high 266 yards and three touchdowns in a 34-14 victory over the Bulls – the second most rushing yards in a single-game by a Seminole tailback…helped pave the way on the offensive line for Cook’s record setting, single-season performance for rushing yards (1,691) and all-purpose yards (1,935)…Seminoles finished the year averaging 31.7 points per game (4th in the ACC) and 424.0 yards per game (4th in the ACC)…leader on an offensive line that produced nine 100-yard rushers on the year (eight by Cook, one by Jacques Patrick)…key protector of FSU’s quarterbacks that ranked fourth in the ACC in pass offense (255.8 yards/game) and third in pass efficiency (142.7) and completion percentage (63.0)…part of an offensive line that ranked 17th nationally, third in the ACC, in yards per carry (5.25) and 18th nationally, third in the ACC, in red zone conversion rate (89.13)…also part of the front line that paced Cook to 1,031 yards and 11 touchdowns against seven teams that ranked in the top 50 nationally in rushing defense…selected to represent the ACC and FSU as a member of the NCAA Autonomy Committee. Reserve offensive lineman saw action in two games in 2014, logging time versus The Citadel and Wake Forest. Appeared in two games as a reserve offensive tackle before suffering a knee injury…redshirt season…shared Offensive Scout Team Player Award with John Franklin III at end-of-season banquet. 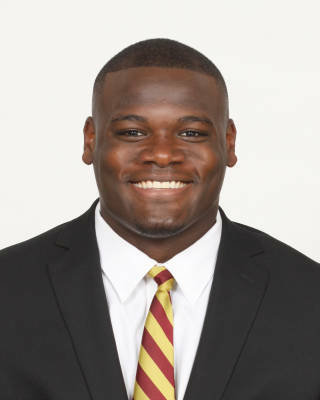 Helped Blount reach the Alabama 6A state playoffs as a senior…played in the Alabama/Mississippi All-Star Game…ranked as a three-star prospect by ESPN, Rivals, 247Sports and Scout…chose Florida State over Auburn and Ole Miss…born November 29, 1994…majoring in editing, writing and media.